Seborrhoeic dermatitis (or seborrhoeic eczema) is a condition that makes your skin red, flaky and itchy. It affects areas of your skin that tend to be greasier, such as your face, scalp and centre of your chest. Seborrhoeic dermatitis is thought to affect up to five in every 100 people in the UK. However, there are many more people who have a mild form of the disease, without even being aware they have it. Dandruff is a mild form of seborrhoeic dermatitis that affects your scalp. You can develop seborrhoeic dermatitis at any age, from puberty onwards. It's most common to develop it between the ages of 30 and 70, although many people also get it as a teenager. It’s more common in men than women. You can also develop a short-lived form of the condition as a baby. It mainly affects a baby's scalp, which is known as cradle cap. This usually goes away on its own within a few weeks or months. The inflammation in seborrhoeic dermatitis is thought to be an overreaction to a yeast called Malassezia, which is present on your skin. The symptoms vary in severity from person to person, from mild dandruff to widespread patches of red, itchy, inflamed skin. You may notice your symptoms flare up at times and then get better again. Seborrhoeic dermatitis causes red, greasy, scaly patches on your skin. The affected area may be itchy. The most commonly affected areas include the following. Your scalp – symptoms range from mild, flaky skin (dandruff) to a more severe, dense, itchy rash. Your face – especially around your eyebrows, cheeks and the sides of your nose. It can also affect your eyelids, causing them to become red, swollen and flaky. This is known as blepharitis. Your ears – the skin inside your ear may become inflamed, as well as your outer ear and the skin behind your ear. Your upper chest and your back, between your shoulder blades, may have round, pink or red patches with mild scaling. Skin folds – these are areas that tend to retain moisture and include your armpits, under your breasts and your groin. Your skin here might appear pink, shiny and cracked. You should usually be able to deal with mild symptoms such as dandruff yourself, or get advice from a pharmacist. If your symptoms are more severe, though or cover a lot of your skin, see your GP for advice. Babies often get a short-lived form of seborrhoeic dermatitis on their scalp, known as cradle cap. This causes greasy, yellow-brown, scaly patches on their scalp. Seborrhoeic dermatitis can sometimes also affect other parts of your baby’s body, including their face, behind their ears and skin folds. In these areas, the affected skin usually has drier, whiter scales than those on their scalp. It can also develop in your baby's nappy area. Any itching in babies is usually mild, and is unlikely to bother your baby. 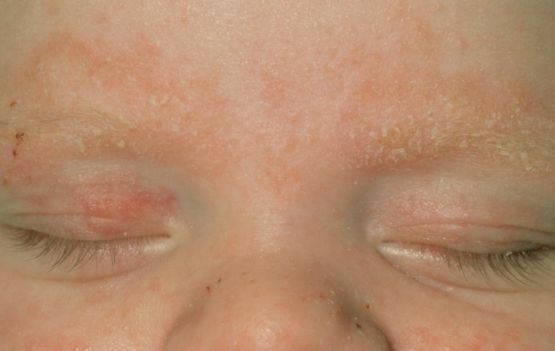 Seborrhoeic dermatitis tends to develop in the first couple of months of a baby's life, although it may appear later. It usually goes away by itself within several weeks to months. If your baby just has cradle cap, you won't normally need to see a doctor for a formal diagnosis. Your health visitor may be able to give you some advice on dealing with it. But if it's affecting other areas of your baby's body, or they have cradle cap that doesn't seem to be responding to normal treatments, see your GP. Your GP will usually be able to diagnose seborrhoeic dermatitis just by looking at your skin and asking you some questions about your symptoms. Seborrhoeic dermatitis can look similar to a number of other skin conditions, especially psoriasis. Sometimes the two conditions can overlap – this is known as sebopsoriasis. If there's any uncertainty whether your symptoms are due to seborrhoeic dermatitis, your GP may refer you to a dermatologist for tests. A dermatologist is a doctor who specialises in identifying and treating skin conditions. If your skin is prone to irritation, try not to use skin products that contain alcohol. Don’t use soap or shaving cream on your face if these irritate your skin. Use an emollient (moisturising) soap substitute instead. Your symptoms may get worse when you’re tired or stressed. Try practising techniques to help you relax, and avoid stress when you can. If your baby has seborrhoeic dermatitis on their scalp (‘cradle cap’), try regularly washing their scalp with a baby shampoo and gently brushing afterwards. This can help to remove the scales. You can also use baby oil or an emollient to soften the scales before gently rubbing them off and washing with water. Your baby’s symptoms will usually start to improve on their own within a few weeks to months. If your baby is affected in other areas, your GP may advise you bathe them at least once a day and use an emollient soap substitute. There's no permanent cure for seborrhoeic dermatitis, but treatment can improve and temporarily clear your symptoms. Your symptoms are likely to come back once you stop using the treatment though. The treatments aim to reduce inflammation and to reduce the amount of Malassezia yeast on your skin. If you have scalp seborrhoeic dermatitis, your pharmacist or GP will probably recommend that you try one of the following treatments. Medicated anti-dandruff shampoos that contain ingredients such as ketoconazole, selenium, coal tar, pyrithione zinc or salicylic acid. You can buy these shampoos from a pharmacy or, in some cases, your GP may be able to prescribe them for you. You should start seeing an improvement with these shampoos straightaway, and your symptoms should continue to improve over several weeks. See our FAQs for more information on how to use these shampoos. Corticosteroid gels or lotions. These are recommended if you have severe inflammation, itching and flaking. You should only use them for short periods unless you have specific advice from your GP. Your GP may also prescribe a medicated shampoo or steroid cream if your baby has cradle cap that doesn't clear up by itself. If your seborrhoeic dermatitis keeps coming back, your GP may recommend that you carry on using an antifungal cream or shampoo once a week or once every two weeks. Your GP may prescribe the following treatments for seborrhoeic dermatitis on your face or body. An antifungal cream containing ketoconazole or another antifungal agent. This helps to reduce the amount of Malassezia yeast on your skin. Your symptoms should start to improve gradually with these creams, and you should see the full effect after about 4 weeks. A corticosteroid cream to reduce inflammation. You may also be prescribed this as a combination cream containing both the corticosteroid and an antifungal agent. Topical calcineurin inhibitors. These also work by reducing inflammation and include tacrolimus ointment and pimecrolimus cream. Your GP or dermatologist may prescribe these if other treatments don't work. Your GP may also suggest you try using an antifungal shampoo as a body wash, in addition to your cream. If your ears are affected, your GP may prescribe medicated eardrops. Your seborrhoeic dermatitis is severe. It covers many areas of your body. It doesn’t respond to normal treatments. The dermatologist may prescribe antifungal tablets if your rash is very widespread. Severe seborrhoeic dermatitis can be a sign of HIV infection. Because of this, your dermatologist may suggest you have an HIV test if you have severe seborrhoeic dermatitis, and there's any risk you could be infected. It’s not fully understood what causes some people to develop seborrhoeic dermatitis. However, it's thought to be associated with a yeast called Malassezia, which is present on our skin. Everyone has Malassezia on the surface of their skin. But people with seborrhoeic dermatitis seem to have more of it, or are more sensitive to it, which leads to an inflammatory reaction. In most people, seborrhoeic dermatitis isn’t associated with any underlying conditions. However, you may be more likely to get it if you have a condition that affects your nervous system, such as Parkinson's disease, or have had a stroke. You’re also at greater risk of getting it if your immune system is suppressed (for example, if you have HIV). HIV can also make your symptoms more severe. Your symptoms may get worse when you’re tired, stressed or generally unwell. You may also notice that your symptoms are worse when it's cold and better in warmer weather. The condition isn’t caused by a lack of cleanliness or having very dry skin, and it isn't related to your diet. It also isn’t contagious, meaning that you can’t catch it or pass it on to another person. How do I use an antifungal shampoo? How do I use an antifungal shampoo? You use an antifungal shampoo in the same way that you use your usual, unmedicated shampoo, but you need to leave it on your hair for longer. Antifungal shampoos contain antifungal agents such as ketoconazole, selenium sulphide or pyrithione zinc. You need to leave an antifungal shampoo on your hair for about five to 10 minutes before rinsing it off. You can use your regular shampoo afterwards if you want to. You will usually need to use the shampoo twice a week for up to four weeks. Don’t use it more often than this without getting advice from your pharmacist first. If you need to wash your hair more than twice a week, use your usual shampoo. Sometimes you may need to remove thick crusts or scales from your scalp before using an antifungal shampoo. You can do this by applying a descaling preparation to your scalp for several hours, before you shampoo. This usually contains coconut or olive oil and salicylic acid. Once your symptoms have cleared up, you can use the antifungal shampoo once a week or once every two weeks to prevent further flare-ups. Different products may work slightly differently. Always read the patient information leaflet that comes with your shampoo, and if you have any questions, ask your pharmacist for advice. Can I use moisturisers and make-up if I have seborrhoeic dermatitis on my face? Can I use moisturisers and make-up if I have seborrhoeic dermatitis on my face? Yes, there’s no reason why you can't use make-up on areas of your skin where you have seborrhoeic dermatitis if you want to. But bear in mind that many people find make-up causes further irritation to their skin. Also, you may find that make-up doesn't work very well because of the changes to the surface of your skin. You may find that non-greasy moisturisers and moisturising (emollient) soap substitutes help to ease your symptoms. Many cosmetic products contain allergens (substances which our bodies may have an allergic response to). Soap and cosmetics containing alcohol may also irritate your skin. If you can, buy products designed for sensitive skin, that are free from alcohol and certain other allergens. Will seborrhoeic dermatitis on my scalp cause hair loss? Will seborrhoeic dermatitis on my scalp cause hair loss? Seborrhoeic dermatitis doesn’t cause hair loss, even if your symptoms are severe. Seborrhoeic dermatitis may cause your scalp to become greasy, scaly and irritated. In mild cases, your head may feel itchy and you may notice fine flakes of dandruff. In more severe cases, the skin on your scalp may become red and weep, or even bleed if you scratch it. But it shouldn't affect your hair. Medicated shampoos and steroid creams should help clear symptoms of seborrhoeic dermatitis on your scalp.